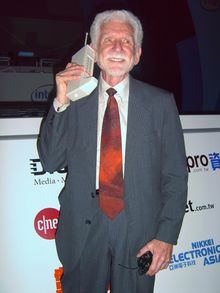 Forty years ago today (April 3, 1973), Martin Cooper made a phone call from a prototype Dyna-Tac handheld cellular phone. The phone, which weighed about 2.5 lb, connected Cooper to Dr. Joel S. Engel, head of research at Bell Labs. And that, of course, was the point. “We wanted to do a dazzling demonstration,” Cooper said. The team’s goal wasn’t just to invent something; it was to let the world know, in as striking a way as possible, that the something had been invented. The demo would end, appropriately, with the technologist processing to the Midtown Hilton, where a gaggle of reporters were assembled for a press conference. Cooper would hand his phone to one of those reporters so she could call her mother in Australia. This entry was posted in consumer electronics history, Mobile, Telephone, This day in information. Bookmark the permalink.